I needed to take a one week trip to Florida to visit family. I’d be flying, renting a car and staying at a friend’s. I still needed to do my work – write a newsletter for Geeks on Tour, maintain the website and manage lots of emails. I decided to leave the laptop at home and take only my iPad. The first obstacle I ran into was simply typing. I did have a keyboard and case for the iPad, (I wouldn’t even try serious typing with the onscreen keyboard) but I didn’t like my Typad keyboard. I had to push the keys too hard, I found touch typing to be impossible, and the case didn’t hold the iPad at a solid angle. I needed to look for a new keyboard. I knew Fort Lauderdale had an Apple store, so I made that one of my first stops after I arrived. 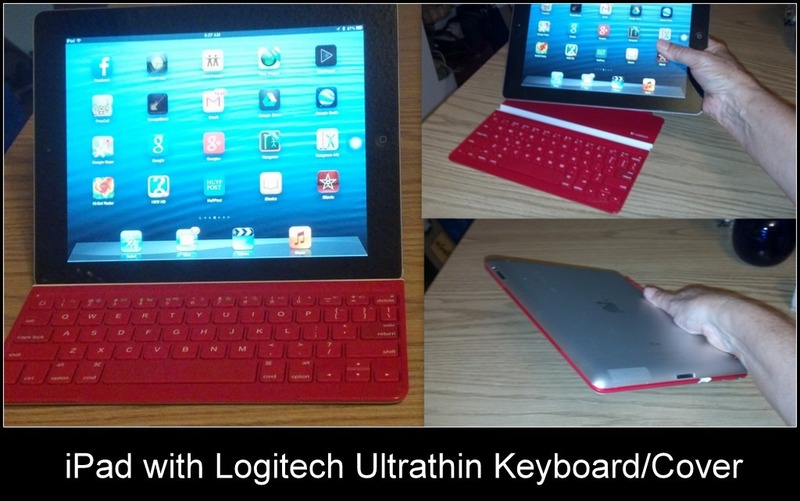 What I found is the Logitech Ultrathin Keyboard Cover. It is perfect! As the name implies, it is ultra thin and it magnetically attaches to simply lay on top of the iPad screen as a cover. When the cover is on, the iPad screen turns off, when you take the cover off, the iPad wakes up. To use it as a keyboard, you simply stand the iPad in the slot provided and pair it via bluetooth. The iPad stands up at the perfect angle, and the combination is solid enough that you can sit it on your lap. The keys have just a little bit of movement and click to them, so I can type every bit as fast as on any full-fledged keyboard. There are many keyboards available to buy … just google for iPad Keyboards! If you want to buy the same one I got, here’s a link to Amazon for the iPad Keyboard Red ; iPad Keyboard Black ; iPad Keyboard White . If you buy using these links, Geeks on Tour will get a thank you dollar or two from Amazon – and we thank you! if you’re accustomed to a computer, either Windows or Macintosh, you know about files and folders. That’s part of a computer’s job is to be a filing cabinet for all your files. The most befuddling thing to realize about the iPad is that it does not have a filing system. 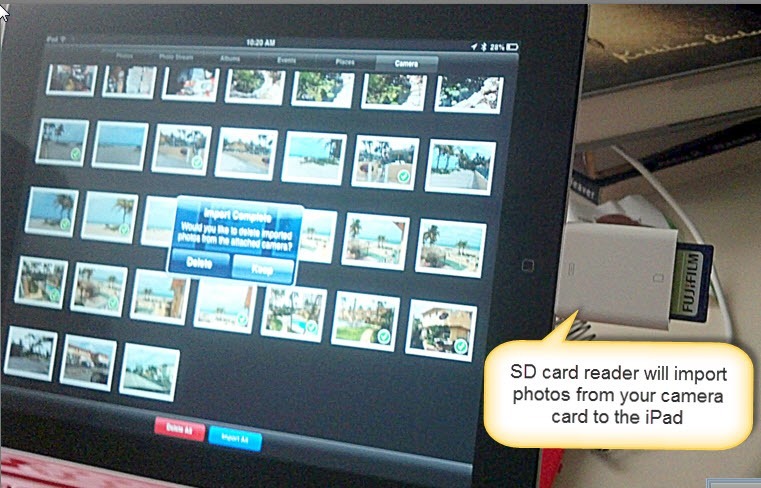 The iPad is an App player, not a file storage device. I need to work with document files, spreadsheet files, presentations, and picture files. What I discovered is that the combination of Dropbox and QuickOffice worked just great – as long as I had a good WiFi internet connection. We store all of our important documents, spreadsheets, and other files used for Geeks on Tour business in our Dropbox anyway. With Dropbox installed on my iPad, I have access to all the files we use on our computers for Geeks on Tour. With QuickOffice, I can edit the files it finds on Dropbox. Now we’re talking! Once I had my keyboard, and I knew I could get whatever pictures I needed, I set to work writing our newsletter. I figured that would be a piece of cake since we used a completely web-based system called AWeber. I just fired up Safari, browsed to AWeber and started writing. Then, I got hung up on my first procedure … adding a picture to the first article. Usually, I go to Google+ and find the picture, then right click on it and copy the URL. It’s the URL that AWeber needs in order to display the picture in our newsletter. Using Google+ on the iPad, I could find NO way to get the URL. That stopped me in my tracks, so I switched gears and started answering some emails. The first email answer required me to attach a file, oops, bumping into a brick wall again. The Gmail app on iPad has no way to attach a file. Is it time for wine yet? Given enough time and thought, I did find ways around my problems. I could get the picture’s URL if I opened Google+ photos using Chrome rather than the Google+ app, and I could send a file via email by going to the file first (in Dropbox) and tapping the share button. But that meant the email was on its own rather than being a reply to a previous email. I can use the iPad as a substitute for my laptop occasionally, but it’s slow going and takes extra thought and effort. I didn’t know I liked my mouse so much until after I tried to do real work with the touchscreen. Simple things like copy and paste – yes it can be done (see this GeeksOnTour video on smartphone copy/paste) but it takes SO much longer than using the mouse! I look forward to getting back to my laptop. I think the newsletter will be late this month! Published by MrsGeek, in Blog. Tagged with Can iPad substitute for Laptop, Dropbox on iPad, iPad keyboards, Quickoffice. I enjoyed reading the article on using an “iPad As a Work Computer. Based on how the “Geeks on Tour” want to use the iPad as a work computer, The article is on the mark. However, my experience is somewhat different. I have an iMac and a Macbook Pro that I rarely use unless I have some heavy-duty photography or video work to do. I have an Apple Bluetooth keyboard that I’ve had since the initial iPad hit the marketplace that I used every so often prior to the release of Siri. Siri has become invaluable. I am writing this response using Siri, use Siri for most of my email and text messages and the productivity work that I do. Currently, with the iPad, I use Pages, Numbers and Keynote when doing productivity work along with Quickoffice and CloudOn that give me access to the Microsoft office suite. Productivity work includes writing articles, developing and sharing Keynote/Power Point presentations and creating spreadsheets with Numbers/Excel. Over time I have created numerous videos/movies using iMovie that have been posted on YouTube, Vimeo, in Dropbox, Google Drive where they have been easily shared. Nearly everything that I post on Facebook and Twitter is posted from the iPad using Siri. The bottom line is the iPad has come to the point, for me, that I rarely need a desktop or laptop computer. Chris and Jim’s article is on the mark, as was noted above, based upon what they are doing with their “Greeks on Tour” program. P.S. My wife says I spend more time with Siri and I do with her. Follow-up on the Logitech Keyboard. When I bought my iPad, I new I would need a cover. Just so happened that I stumbled onto the Logitech and quickly realized “it is just the ticket.” I would express the same admiration for the convenience of this model keyboard. I also bought a neoprene carrying case by INCASE just to keep the whole unit relatively protected. I really enjoy the portability of the iPad, but I also want my laptop close by. Thank you for the wonderful work you do in helping us with Picasa, Google Earth, and so much, much more. Great article. I have been interested in this concept too and you did a great job explaining about the similar things I do on my laptop. Thanks for the “real people” review. You confirmed my suspicions. I got a tablet six months ago, preceding a month-long vacation. I found it useful for simple email, reading, games and music but no substitute for a computer. I looked at the separate keyboard, but wondered if I would end up carrying a box of add-ons in addition to the charger and earbuds, and spending as much money as if I bought a laptop. Thanks so much! You have answered all the questions I had but hadn’t found anyone to ask about using a tablet as my only computer. Looks like a laptop will still be in my future but maybe with the addition of an iPad.